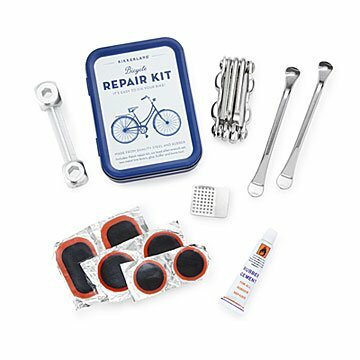 The basic tools in this compact tin will rescue puncture-interrupted bike trips. Includes: (6) headed allen set, patch repair kit, (2) metal tire levelers, glue, buffer, and bone tool. I was impressed with how well made the tools are. This has a very attractive design. It's small & compact making it easy to take everywhere. We bought this for my brother in law who lives in Panama and bikes everywhere. He went to use it for the first time & the tool snapped in half on the first turn. Very disappointing, as we were hoping it would be a quality product based on the reviews. This was the perfect solution for a tire that needed fixing more than once on a vacation to the Jersey shore. We purchased this for a friend who bikes everywhere, including in competition. He was very impressed with the quality craftsmanship of the tools within. The contents are very thoughtful, useful and the overall packaging is well done. He also loved the retro look of the tin. This was a big hit for a hard to buy for recipient. Yay!!! Bought this for my son for Christmas. He is an avid biker. This is perfect for him. Not bulky, but puts everything he needs at his fingertips. It needs to have an instruction manual. We were not sure how to use all the components. My boyfriend keeps this in his underseat storage when biking. He hasn't had to use it yet but is nice and compact. It has everything he needs to patch his bike and make it home if something happened. It was a great gift for my biking friend.